CAIRO (AP) — Islamists approved a draft constitution for Egypt early Friday without the participation of liberal and Christian members, seeking to pre-empt a court ruling that could dissolve their panel with a rushed, marathon vote that further inflames the conflict between the opposition and President Mohammed Morsi. The vote by the constituent assembly advanced a charter with an Islamist bent that rights experts say could give Muslim clerics oversight over legislation and bring restrictions on freedom of speech, women's rights and other liberties. The draft, which the assembly plans to deliver to the president Saturday, must be put to a nationwide referendum within 30 days. Morsi said Thursday it will be held "soon." The opposition has called for a major rally Friday in Cairo's Tahrir Square, where some demonstrators have camped out in tents since last week to protest decrees Morsi issued to grant himself sweeping powers. Hundreds gathered in the plaza for traditional Friday prayers, then broke into chants of "The people want to bring down the regime!" — echoing the refrain of the Arab Spring revolts, but this time against a democratically elected leader. Other cities around Egypt braced for similar protests. The Islamist-dominated assembly that has been working on the constitution for months raced to pass the charter, voting article by article on the draft's more than 230 articles for more than 16 hours. The lack of inclusion was on display in the nationally televised gathering: Of the 85 members in attendance, there was not a single Christian and only four women, all Islamists. Many of the men wore beards, the hallmark of Muslim conservatives. For weeks, liberal, secular and Christian members, already a minority on the 100-member panel, have been withdrawing to protest what they call the Islamists' hijacking of the process. "This constitution represents the diversity of the Egyptian people. All Egyptians, male and female, will find themselves in this constitution," Essam el-Erian, a representative of the Brotherhood, declared to the assembly after the last articles were passed just after sunrise Friday. "We will implement the work of this constitution to hold in high esteem God's law, which was only ink on paper before, and to protect freedoms that were not previously respected," he said. The sudden rush to finish came as the latest twist in a week-long crisis pitting Brotherhood veteran Morsi and his Islamist supporters against a mostly secular and liberal opposition and the powerful judiciary. Voting had not been expected for another two months. 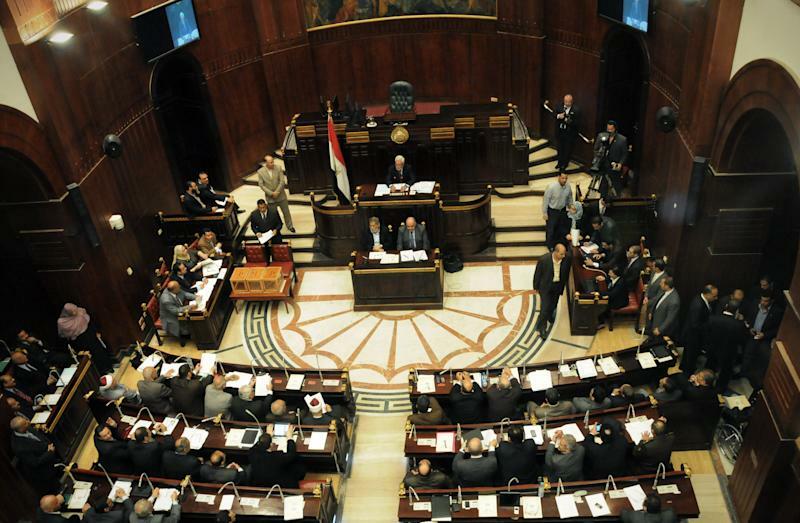 But the assembly abruptly moved it up in order to pass the draft before Egypt's Supreme Constitutional Court rules on Sunday on whether to dissolve the panel. "I am saddened to see this come out while Egypt is so divided," Egypt's top reform leader, Nobel Peace laureate Mohamed ElBaradei said, speaking on private Al-Nahar TV. But he predicted the document would not last long. "It will be part of political folklore and will go to the garbage bin of history." "It is trying to impose a constitution monopolized by one trend and is the furthest from national consensus, produced in a farcical way," the National Salvation Front said in a statement, read by Waheed Abdel-Meguid, one of the assembly members who withdrew. Thursday's vote escalates the already bruising confrontation sparked last week when Morsi gave himself near absolute powers by neutralizing the judiciary, the last branch of the state not in his hands. Morsi banned the courts from dissolving the constitutional assembly or the upper house of parliament and from reviewing his own decisions. Speaking in an interview on state TV aired late Thursday, Morsi defended his edicts, saying they were a necessary "delicate surgery" needed to get Egypt through a transitional period and end instability he blamed on the lack of a constitution. In a sign of the divisions, protesters camped out in Cairo's Tahrir Square who were watching the interview late Thursday chanted against Morsi and raised their shoes in the air in contempt. The president's edicts sparked a powerful backlash in one of the worst bouts of turmoil since last year's ouster of autocrat Hosni Mubarak. At least 200,000 people protested in Cairo earlier this week demanding he rescind the edicts. The president's Muslim Brotherhood group has called for a similar massive rally for Saturday, though they decided to move the location of the protest in Cairo from Tahrir square to avoid frictions. Street clashes have already erupted between the two camps the past week, leaving at least two people dead and hundreds wounded. And more violence is possible. The Constitutional Court's announcement that it would rule on the legitimacy of the assembly was in direct defiance of Morsi's edicts. It will also rule Sunday on whether to dissolve the upper house of parliament, which is overwhelmingly held by Islamists. Most of the nation's judges are on indefinite strike to protest the edicts. It is not clear what would happen to the approved draft if the court dissolves the assembly. The crisis could move out of the realm of legal questions and even more into the more volatile street, to be decided by which side can bring the most support. The opposition is considering whether to call for a boycott of any referendum on the constitution or to try to rally a "no" vote, said Hamdeen Sabahi, a National Salvation Front leader who ran in this year's presidential race and came in a surprisingly strong third. "The people should not be made to choose between a dictatorial declaration or a constitution that doesn't represent all the people," he told independent ONTV, referring to Morsi's decrees. "He is pushing Egypt to more division and confrontation." 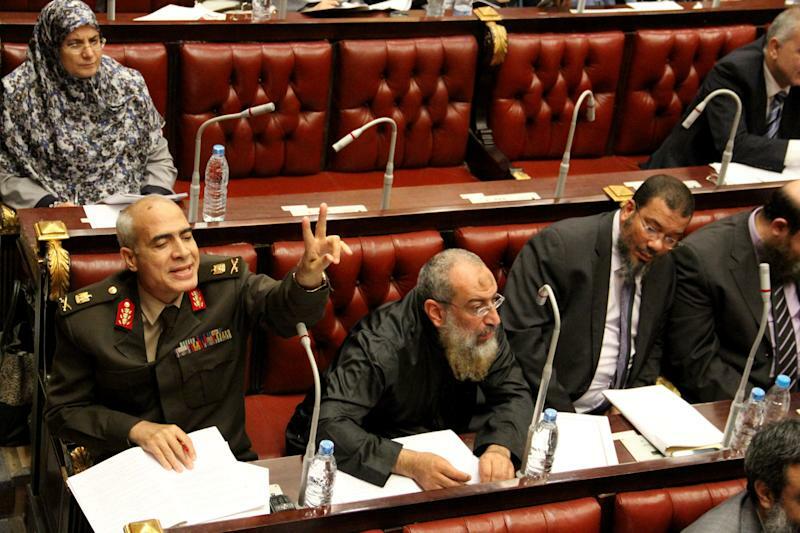 During Thursday's session, assembly head Hossam al-Ghiryani doggedly pushed the members to finish. When one article received 16 objections, he pointed out that would require postponing the vote 48 hours under the body's rules. "Now I'm taking the vote again," he said, and all but four members dropped their objections. In the session's final hours, several new articles were hastily written up and added to resolve lingering issues. "We will teach this constitution to our sons," al-Ghiryani told the gathering. Islamist members of the panel defended the fast tracking. Hussein Ibrahim of the Brotherhood said the draft reflected six months of debate, including input from liberals before they withdrew. Over the past week, about 30 members have pulled out of the assembly, with mainly Islamists brought in to replace some. As a result, every article passed overwhelmingly. The draft largely reflects the conservative vision of the Islamists, with articles that rights activists, liberals and others fear will lead to restrictions on the rights of women and minorities and on civil liberties in general. Previously, the term "principles" allowed wide leeway in interpreting Shariah. But in the draft, a separate new article is added that seeks to define "principles" by pointing to particular theological doctrines and their rules. That could give Islamists the tool for insisting on stricter implementation of rulings of Shariah. The draft also includes bans on "insulting or defaming all prophets and messengers" or even "insulting humans" — broad language that analysts warned could be used to crack down on many forms of speech. It also preserves much of military's immunity from parliamentary scrutiny, putting its budget in the hands of the National Defense Council, which includes the president, the heads of the two houses of parliament and top generals. The committee has been plagued by controversy from the start. It was created by the first parliament elected after Mubarak's ouster. But a first permutation of the assembly, also Islamist-dominated, was disbanded by the courts. A new one was created just before the lower house of parliament, also Brotherhood-led, was dissolved by the judiciary in June. Associated Press writers Sarah El Deeb and Lee Keath contributed to this report.